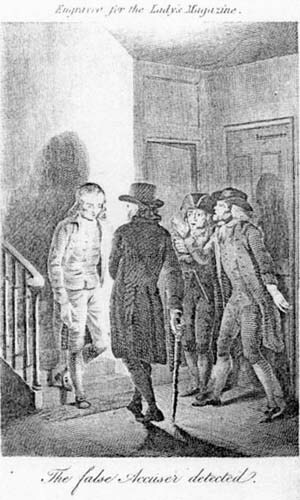 Frontispiece of October Issue, 1809, "The false Accuser detected." 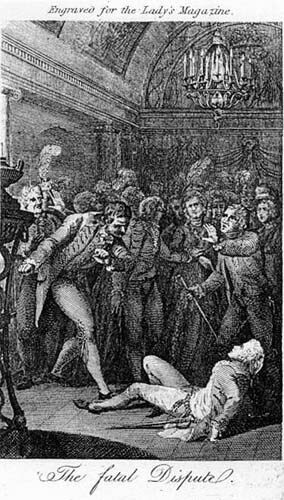 Frontispiece of December Issue, 1809, "The fatal Dispute." 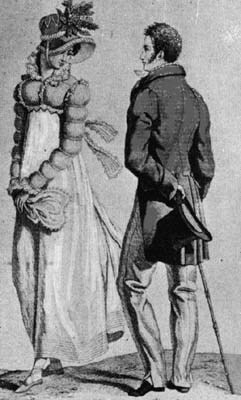 Male and female Walking Dress, 1810. Female Figure: The lady rests on a rock, sitting upon her cashmere shawl, so as not to muss her white muslin dress. Her high gloves come up almost to the bottom of her short sleeves. A lace veil falls from her bonnet. Male Figure: The man's clothes are designed to draw attention to his slim waist and to accent the muscles of the waist and shoulders. The high, almost puffed shoulders is a look we start to see in the teens. The coat is double-breasted. The hankercheif, rather than a formal cravat, indicated the extremely relaxed and casual nature of this outfit. The excessive trim on the pants is not typical of the male fashion plates I have seen. The boots are interesting because of their curved tops, much more extreme than those in the plate above. Summer cotton dress with eyelet embroidery trim, man in trousers, 1812. 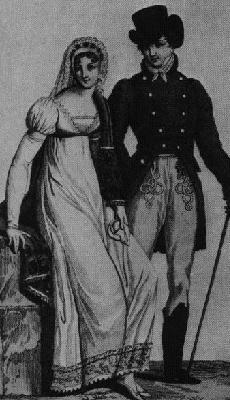 The male's dress here is extremely similar to that in the undated Austrian plate on page 2 labelled, "Le Diable, ein neues Modespiel in Paris." Left: Plate no. 29, labelled "Le Diable, ein neues Modespiel in Paris" Male Figure: Day or Morning wear for men. Note the extreme padding of the shoulder here, almost a puff sleeve. The pants have a noticeable side seem as well and are slit so they can cover part of the foot. Probably c. 1811-1815. Right: Plate no. 32 Men's Greatcoat, worn over tight trousers. The trousers here are much tighter than those shown in the English plate of 1807 (on page 2). The are quite tight and like the plate to the right have a clearly visible seam. 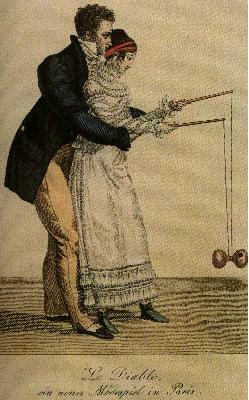 The man carries a riding crop in his hand. The coat is not in the cutaway style as it may first appear, but is held to the side by the model to reveal the pants and the lighter lining. Detail of the shoes of Plate 29, above. Incroyable, 1813. Our opinion of male makeup today insures this plate still has some of the same shock value it did in the early nineteenth century. The "Incroyables" were radical dressers, and the one shown here is clearly made up with rouge. The waist is so drawn in, one suspects a corset is worn. The coat is cut with high collar and wide lapels. The parasol, to protect the man from the sun, is another attribute like the makeup, that gives the plate an "extreme" feel. 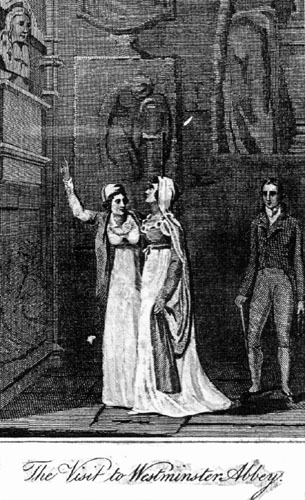 Frontispiece of March Issue,1813, "TheVisit to Westminster Abbey."